Salam sisters & hello everyone! I can already image this bag sits nicely on my bag section in different colors! Oh my... <3 Its kinda like a jelly plastic bag pretty structured and a lil see through. I might pick up colors that are not too "transparent", I would not like people to see what I am carrying! Well, I'm a paranoid type of person perhaps. Well, it better to take safe steps right? I would love to own that neons pink color and the gold glitter color ones! 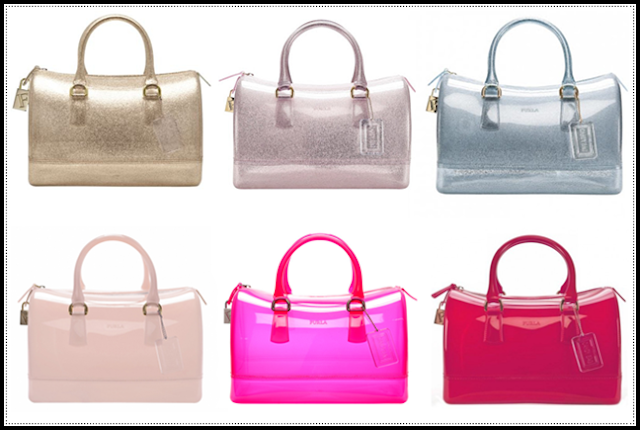 I don't really sure that we have Furla here in Malaysia, as what i know we have it a years back ago and it close down. I mainly see people bought this through online shop and pre orders. There are imitation too I guess and the original price cost around RM900+ while the imitation cost below RM400 if I am not mistaken. Well its up too you I guess as long as you are happy! What is your wishlist for this week? 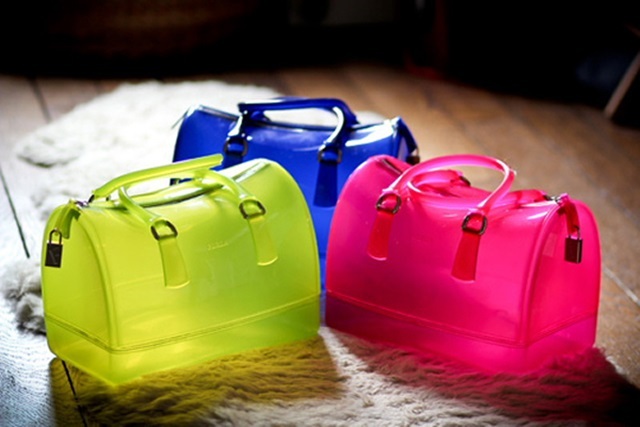 minie pun teringin nak furla candy bag ni ! kan... i like the neon pink so much! candy just suits their name perfectly! comelnya mereka! dh ckp kt tunang nk beg ni wt hntaran tp dia kt pelik..
Wowo......i like jelly bean colour...buf my daughter say," mama pink colour nice...plz...nnt akak dh besar boleh pinjam...hahaha so sabrina..? I like the glitter pink bag, yg top middle tu! huhu, Aritu nak beli keychain dia, tp malas la sbb mcm membazir tp comey! hmmmm.. dilemma. Your blog is super cute! These bags are so interesting haha. hi sab! i own the pink one and trust me, it is worth the price! sangat cute! my pocket hatechu. hehehe... in sya Allah one day!